The thing about butterflies is that they have two sides. 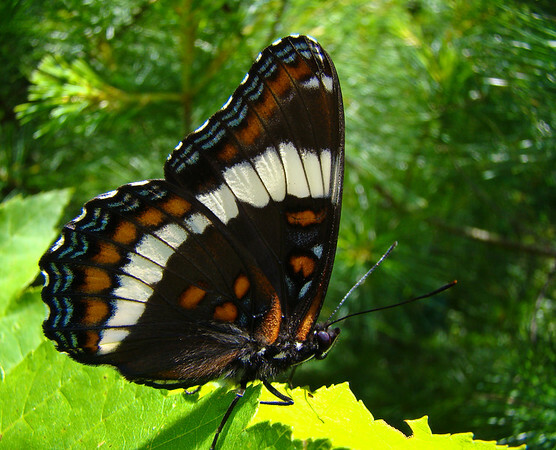 The upper side is beautiful, and the underside can be two. The second thing about butterflies is you take what you can get. Some never sit with wings open, so open wing shots are almost certainly collected samples, and some only sit with wings open. 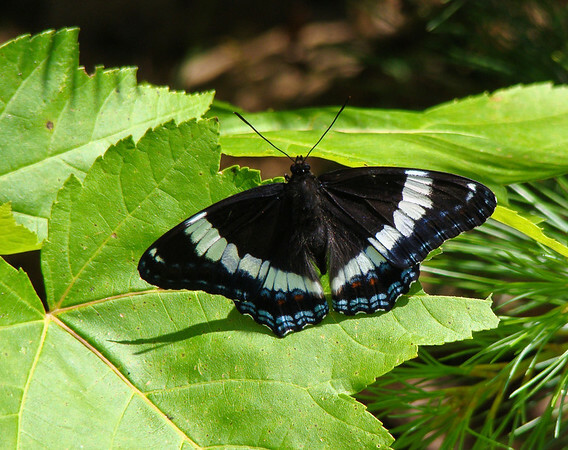 The Black Admiral is one that does both, though closed wing is more common. When this one lit beside the trail, I was able to get one tel-macro shot of it open winged, and then it closed, and, though I waited, and though I worked the equally beautify closed wings, it never sat open winged again for me. This shot is taken from about 2 cm. using the H50s macro setting on full wide. In this case the butterfly was perfectly posed, with background foliage far enough behind to be well out of focus (and some interesting bokeh). I like the way the light, slightly from the side, catches in the furry surface of the wing and brings out the detail. Sony DSC H50 at full wide and macro. F4.0 @ 1/160th @ ISO 100. Programed auto. Cropped slightly from the right for composition in Lightroom. Some Recovery to bring down the brightness of the sunlit leaf. Added Clarity and Vibrance. Landscape sharpen preset. And for those who wonder, here is the open wing shot, cropped slightly to make the subject larger in the field. Beautiful captures, Steve. Butterflies are the toughest subjects. I put you as may be attending our Birders who Blog,Tweet and Chirp outing in Milford,Ma.